Monte Albán is an archaeological site that is located 10 km from the city of Oaxaca. It was named by the Zapotecs as “Dani Baá” or Montaña Sagrada and, later, “Yucucui” or Cerro Verde, by the Mixtec indigenous people who inhabited it around the 12th century. As it happened with several pre-Hispanic metropolises, Monte Albán was inhabited by more than one culture. The origin of the first inhabitants is reason for debate, since archaeologists have not been able to specify it. Later, the city was inhabited by the Zapotecs and, finally, by the Mixtecs. In addition, studying the architecture, the specialists found that Monte Albán had contact with other cultures, mainly with the inhabitants of the powerful Teotihuacán, in the center of Mexico. Today modern Mexico City. At Monte Albán, visitors can find three main structures, all with primarily ceremonial functions: the South Platform, the Big Ball Game and the Danzantes Building (or L Building). The South Platform is a construction of two bodies and the highest in the city; From there, you can see the rest of the site. The Plaza de los Danzantes is a sui generis construction in which several stelae with calendric and anthropomorphic glyphs stand out. Cost: $75.00 pesos. Credit cards and cash accepted. Accessibility: Monte Albán is not handicap accessible. Recommendation: If possible, only visit Monte Albán on weekdays and arrive at 8 AM to avoid the crowds. Weekends and holidays can be very crowded and weekday afternoons you will find school tours with a lot of kids at Monte Albán. Weekday mornings allow you cooler temperatures and beat the crowds. Stop for lunch in the restaurant and visit the small museum on your way out. 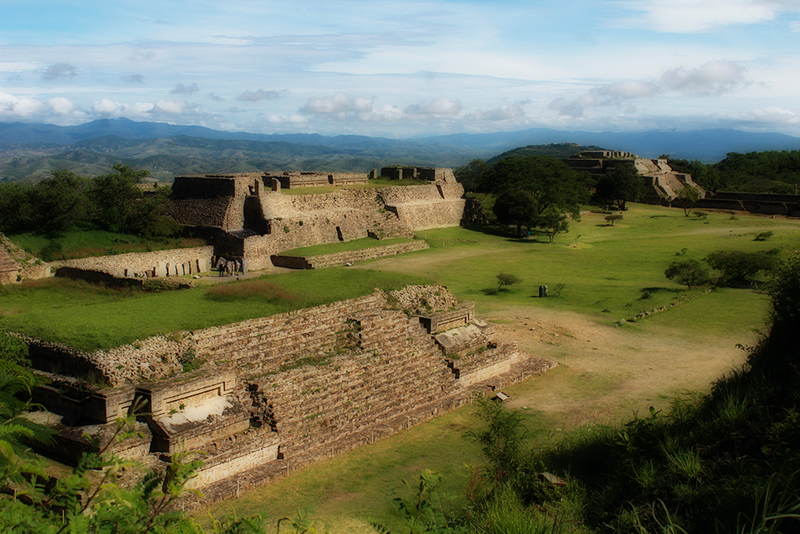 You can enjoy Monte Albán in under 3 hours. There are nice break areas in Monte Albán with benches located under trees overlooking the valley where you get a great breeze year round. Taxi: A taxi from downtown Oaxaca City will cost about $120 pesos, ask first before accepting the ride. To arrive back to town you need to wait for someone else to arrive by taxi and take a ride back to the city. Taxis only arrive to Monte Albán to drop off people, the location is not on a main street and up a mountain road away from the city, not serviced by city bus or a route frequented by taxi drivers. Tourist Bus: There are private tourist buses and vans that make hourly trips to and from Centro Oaxaca – Monte Albán. The average cost is $55-$75 pesos round trip per person. On the road Francisco Javier Mina in front of Rivera del Angel hotel, there is a small office that sells the tickets and departure area. (map) If you are staying at a hotel in Oaxaca, ask the front-desk, your hotel may have a service arrangement with a local bus/van company. If they offer to call you a taxi, decline and take a taxi on the street. You can expect to pay twice the cost for call service taxis. Restaurant/Cafe: Monte Albán has a restaurant on site just at the entrance of the ruins. The serve cold beer as well. A worthy stop after walking the ruins and climbing all the stairs. But don’t expect the best service. The food is good. Museum: Monte Albán has a small museum at the entrance (next to the restaurant). It is free of charge to enter the museum, you don’t even need a ticket to the ruins to visit the museum or restaurant. Bathrooms: Bathrooms are available at the entrance inside the complex that houses the museum and restaurant.